Having access to a wide variety of online trading and investment choices, powerful trading platforms, and research and education can help you build a portfolio suited to your needs. At AMID Financial Center, Accessing a trading specialist is always free and our low commission per online trades applies no matter your account balance or trading frequency. Trade on over 100 market centers in 24 countries. Direct market access to stocks, options, futures, forex, bonds, ETFs and CFDsfrom a single AMID Universal Account. Access market data 24 hours a day and six days a week to stay connected to all global markets.Convert currencies at market determined rates as low as 1/10 of a basis point, or create a position collateralized by a non-native currency. Trade stocks with confidence, Trade stocks by accessing a spectrum of resources like real-time quotes, charts, third-party analysis reports, and the most advanced trading platforms to ensure you have the power to build your strategy the way you want. With a AMID account, you can enter your stock orders knowing that we're committed to filling your order quickly at the best available price. Our routing intelligence combined with the speed of our routing technology helps us route your stock orders fast. This dual approach dynamically sends your orders to different market centers to fill. Choose the cutting edge online stock trading software that suits your unique requirements. Our stock market trading software ranges from web based software to the professional level trading software. AMID offers 2 commission plans for online stock trading, Per Trade (plan A) and Per Share (plan B). Select the commission schedule that will save you the most money. Need assistance placing a trade or have questions about your account? Connect with a live representative in pre and post market hours. No automated answering service like the competition. We pride ourselves in providing fast and reliable live help to all traders. Receive our free market newsletter. A weekly newsletter emailed once per week giving insight on stock market conditions and what to expect in the week ahead. No need to open more than one account for trading different instruments. Trade Stocks, Bonds, Options and Futures from a single account. Research details about your account. Check your trade activity, equity, balances and more from our dynamic back office software. AMID Financial Center management has its roots in options trading going back 21 years. Whether you’re an equity trader new to options trading or a seasoned veteran, AMID Financial center can help you pursue options trading strategies with powerful trading platforms, idea generation resources, and the education and support you need. Options can play a role in virtually every investor’s portfolio. They can be used to hedge against risk, generate income, and even speculate on market moves. AMID has an array of tools and specialized guidance for options traders of all levels. Protect the value of your portfolio and stocks you already own. Hedge your position with potential to lock in a profit in the underlying security, or to help minimize potential downside risk. Opportunity to speculate using the power of leverage. This allows for strong potential returns, but can also result in significant losses. Use basic to aggressive approaches to capitalize on market moves. Innovative Tools – Intuitive trading tools and ideas for both new and experienced options investors. Smart Technology – Best-in-class, and a multi-legged trade ticket that let you combine up to 4 options or 3 options plus stock in a single order. Mobile Trading – Analyze your choices and place options trades from anywhere. Exceptional Value – Low, flat commission pricing. Our sophisticated trading technology is built by professionals for professionals, and offers significant benefits to options traders who are serious about their results. 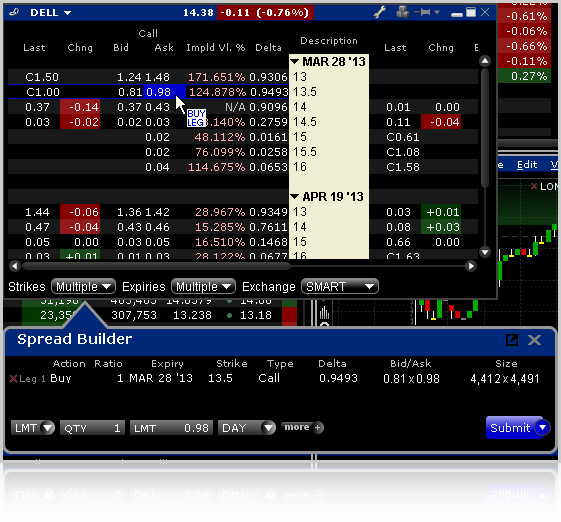 AMID Pro, which provides streaming option chains, quick-click order transmission and the Greeks; which lets you easily create combo orders and spreads from among 18 predefined strategies, or create your own leg-by-leg positions; Write Options tool, which lets you efficiently write calls or puts against your existing long or short stock positions; and Trade large or complex orders with the help of an experienced broker at our Stocks and Options Trade Desk. Each broker on our trade desk has over 10 years trading experience, and will strive to get the best AMID Financial Center execution for your trades. Want to learn more? Discover more about options trading. Upgrade your account to begin trading options. AMID Financial Center offers personalized help, product selection, and low pricing for you to pursue your fixed income investing goals, whether you are looking to generate income or diversify your portfolio. AMID searches more than 200 dealers to help find the right bond for you at the best price available to us, with access to over 36,000 securities. AMID offers electronic access as well as a Bonds Trade Desk to US and European corporate bonds, US government securities,US Municipal bonds, non-US Sovereign bonds in Asia and Europe, fixed income futures and fixed income options,all from a single account. A bond is a debt obligation issued by a corporation or government entity. They are commonly referred to as fixed-income securities. Bonds & Fixed Income can achieve a source of stability, diversification & income. Bonds and fixed income investments offer a wide range of benefits for investors of all types. They can be used to generate steady income to meet living expenses. They can help reduce risk by spreading your money among different asset types. And certain bonds offer valuable tax advantages to help you keep more of what you earn. Bonds may offer less volatility than other investments and add diversification to a portfolio. They are frequently used for income generation. Pay special attention to credit quality.This reflects the issuer’s ability to make scheduled interest and principal payments. Bond values move inversely with interest rates.When interest rates rise, bond values typically fall, and vice versa. Fixed Income assets are not niche investments.They should be an essential part of every balanced portfolio, for investors of all ages. Today's fixed income investments can help diversify your portfolio. With AMID Financial Center wide selection of free tools, you can find the right bonds and CDs to help you generate income, protect your portfolio from interest rate increases, and more. Regular income - If you're looking to supplement your income or help fund retirement, fixed income investment may provide a steady stream of income monthly or quarterly. Diversification - Low volatility and low correlation to stocks can help balance your portfolio, helping to reduce portfolio volatility in uncertain markets. Capital Preservation - Fixed income prices may fluctuate, but you can rely on receiving the full-face amount when your fixed income investment matures. If safety of your principal is your primary concern, and you're willing to accept a comparatively low yet dependable return, Treasury securities (Treasuries) can be an attractive choice. STRIPS2 (Treasury Zeros coupon bonds)—are popular with investors who want to receive a known payment on a specific future date. Issued by either a government-sponsored enterprise (GSE) or a government-owned corporation, and are debt obligations solely of the issuing agency. Agency bonds are generally liquid investments featuring high credit quality.Corporate BondsIf you're searching for a potentially higher yield than government bonds, corporate bonds may offer a more aggressive fixed income choice for you. However, corporate bonds can be riskier than other bonds, as returns depend on company profits and financial management and other factors that impact the ability of the issuer to repay its debts.Mortgage-backed SecuritiesMortgage-backed securities (MBS) are one of the few fixed income securities that pay both interest and a portion of principal on a monthly basis, which may make them an attractive investment for investors seeking regular income.Draw on Valuable ResourcesDedicated Bond Specialists can review your portfolio and help you implement changes designed to help meet your investment objectives. Bond Education Center will help you invest wisely and learn new strategies. Online Commodity and Futures Trading with the Help of a Professional Futures Broker from AMID Financial Center. AMID Financial Center is a leading brokerage focused on implementing advanced technology, service, and support to a wide range of traders. We strive to lead the industry with a focus on speed, reliability and service. World-class online trading platforms, no hidden fees, broker assistance on trades and low commission rates. Not all traders have the same needs. Not all platforms fit all traders, and AMID Financial Center has one of the WIDEST selections of platforms. High-definition charting, support for 20+ data feeds, dynamic portfolio-level strategy back testing. Choose the optimal data vendors and executing “FCM”. Build robust trading strategies, accurate market data with fast execution and low transaction fees. Daily Support and Resistance Levels. Take advantage of multiple trading platforms; real-time technical, fundamental and price/risk analysis tools. Use Trader advanced trading tools, including; combo orders and spreads from among 18 predefined strategies, or create your own leg-by-leg positions. AMID Financial Centre makes it easy to trade futures products, providing you with innovative technology, advanced trading tools, and flat, low commissions—all backed by an experienced futures support team. AMID Financial Center offers a broad array of futures trading tools and resources. multiple advanced trading platform, free technical studies, AMID education, 24/7 trading specialist support, paper Money, and live futures pit audio are just some of the benefits you get. Experienced derivatives traders enjoy the advantages of futures trading, such as diversification, leverage, and a nearly 24/6 market. pairs trading integration, free trading platform support, and AMID education, such as weekly webcasts, online courses, and live workshops. Explore new approaches to your range of option alternatives by trading options on futures. Whether you are a high volume trader or a low volume trader, we will meet your needs with the high quality of service, dependable platforms at competitive price. Bookmark this free resource by AMID Financial Center and access futures quotes, charts, and option chains along with technical analysis! Click here to access Free Quotes & Charts. Take advantage of short-term fluctuations in the market by trading ETFs just like stocks. Enjoy greater liquidity through hands-on trading like a stock. Use advanced technology, including multi-product spreadsheet interface, real-time streaming quotes, and wide variety of order types and specialized trading and analysis tools. ETFs are supported in options trading and short selling. Greater financial transparency through daily reporting of the ETF's holdings. Exchange-traded funds (ETFs) are a simple, cost-effective way to diversify your portfolio by combining characteristics of mutual funds and individual stocks. Like mutual funds, ETFs are made up of a basket of securities. Like stocks, ETFs are traded on exchanges, with fluctuating value throughout the day. ETFs generally seek to track a benchmark index such as the S&P 500, with funds available for every major asset class. Visit our helpful ETF Knowledge Center to learn about the basics or find information on more in-depth topics. And enjoy access to advanced trading platforms, powerful tools, educational resources, and the help of our trading specialists. Everything you need to trade ETFs–all in one place. If you’ve stayed away from ETFs because they sound complicated, now is the time to see how we make ETF trading easier. RISK DISCLOSURE: Past results are not necessarily indicative of future results. The risk of loss in trading financial instruments can be substantial, and you should carefully consider the inherent risks of such an investment in light of your financial condition. Day trading on margin or short selling may result in losses beyond your initial investment. Options trading is highly speculative and contains a high degree of risk and is not suitable for all investors.